One lesson that mobster Theo Tonin (Adam Arkin) should learn is that Harlan County is where his people tend to die. 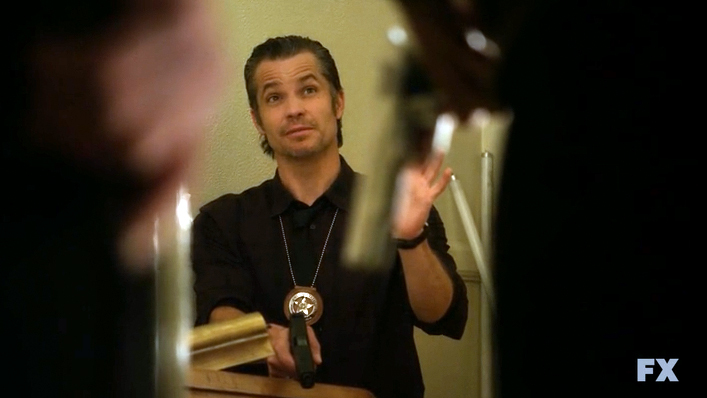 Then again, Tonin is desperate because Drew Thompson aka Sheriff Shelby (Jim Beaver), who can link him to a murder and put him away for good, is alive and in the hands of the Marshals, since Raylan (Timothy Olyphant) finally caught him last episode. The only problem now is getting Drew out of Harlan County and into the hands of federal officials. finally deciding to let Boyd help locate Drew. 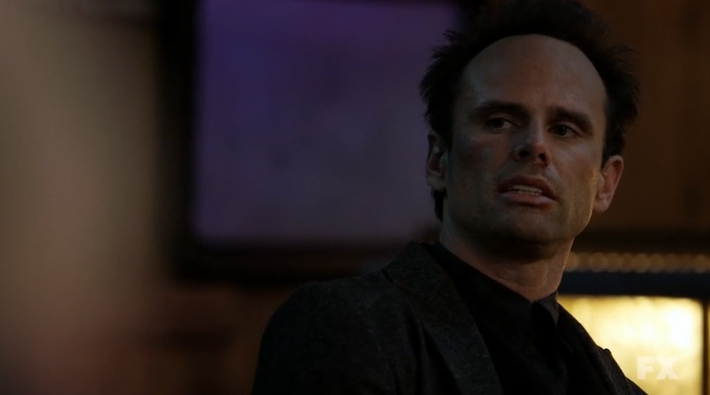 This forces Drew to start thinking like Raylan. 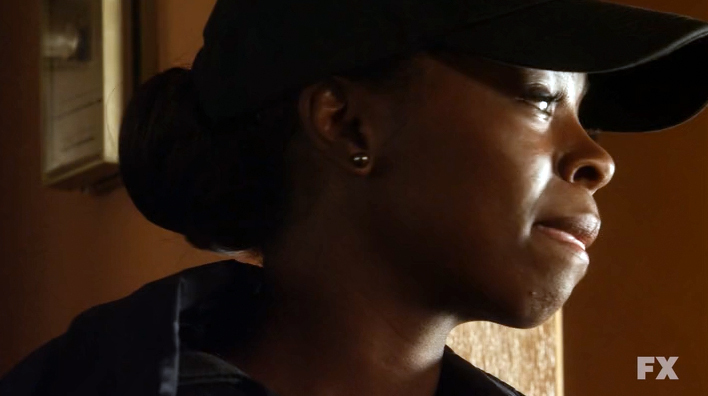 Raylan has Drew at his father’s house, where the season all began, holed up with fellow Marshal Rachel Brooks (Erica Tazel). Raylan’s boss, Art Mullen (Nick Searcy) and fellow Marshall Tim Gutterson (Jacob Pitts) have headed out with a convoy, meant to act as a diversion while Raylan and Rachel wait for a helicopter. Boyd, temporarily forgiving Colt (Ron Eldard), sends him to intercept the convoy, which Colt does by setting up some roadside bombs right out of the Afghanistan War playbook. Marshall Tim sees through the ploy, but now the convoy is trapped between roadside bombs, and Colt has a sniper trained on them. Tim decides to circle the wagons while he tries to figure a way out. Raylan takes Drew Thompson to the local high school to wait for the helicopter. After leaving his father’s house, Constable Bob (Patton Oswalt) shows up, reacting to the motion detectors Bob placed there. Unfortunately for Bob, the mob has sent Yolo (Bobby Campo), a sadistic assassin, to the house, and Bob falls into his clutches. Now with a name like Yolo, you know this guy has to be a complete douchebag, and he proves it by punching Bob, trying to force Bob to give up Drew Thompson’s location. Bob won’t talk, even though he’s punched bloody. 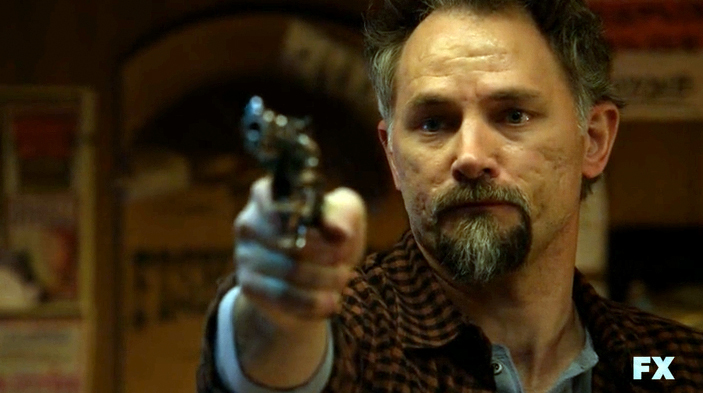 But Bob gets his hand on a knife and cuts Yolo with a knife in the leg, in one of those arteries that’s connected right to your heart, so Yolo bleeds out pretty quick, and when Raylan arrives, he finds Bob on top of Yolo, beaten to hell. Raylan brings Bob back to the high school. Boyd remembers that when he was in high school with Raylan and Ava, an astronaut visited the school, the coolest thing the kids in Harlan County had ever seen. He came by helicopter and landed in the baseball field. He knows where Raylan is hiding out. Boyd arrives with a bunch of mobsters, but they find only Raylan and Bob, ready to fight to the death, but no Drew Thompson. As the mobsters debate their next move, sirens can be heard in the distance. It seems that Marshall Tim was able to get out of the roadside bomb trap and he and Art were arriving just in time. Back at Ava’s bar, Augustine decides to go after Ava, treating her cruelly but along the way he outs Johnny (David Meunier)’s betrayal. Ava takes Augustine’s gun and leaves the bar, knowing that Johnny has betrayed her even as Johnny tries to tell her that he did so out of love. With the mob and Boyd in complete chaos, it is revealed that Drew Thompson got out of town on the five o’clock coal train out of Harlan, the only place no one thought to look. It was Bob’s idea, so really, Constable Bob can be credited with taking down the Detroit Mob, in a sense. If Drew Thompson talks, then Theo Tonin goes down. 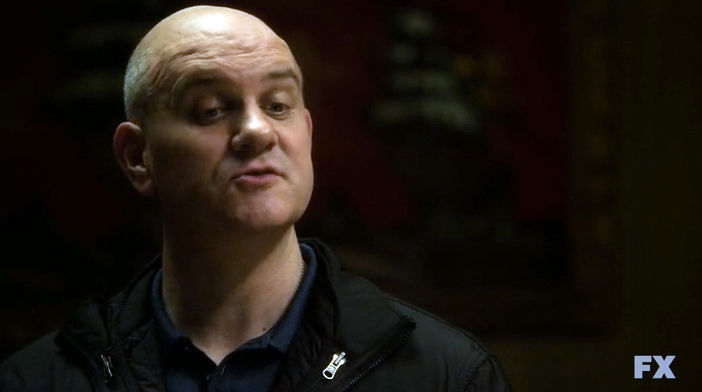 This will leave a power vacuum in organized crime, and also take the threat of death off Boyd and Ava. On the other hand, Boyd and Ava still have Johnny’s betrayal, Colton’s betrayal, and Ellen May (Abby Miller)’s testimony to deal with before they can get back on track, and they’re out all their money to boot. This was terrific episode, with two more to go before this excellent season wraps.